As I mentioned, the event was to happen on March 28, on the second day of the Easter, which is a public holiday here in Holland. 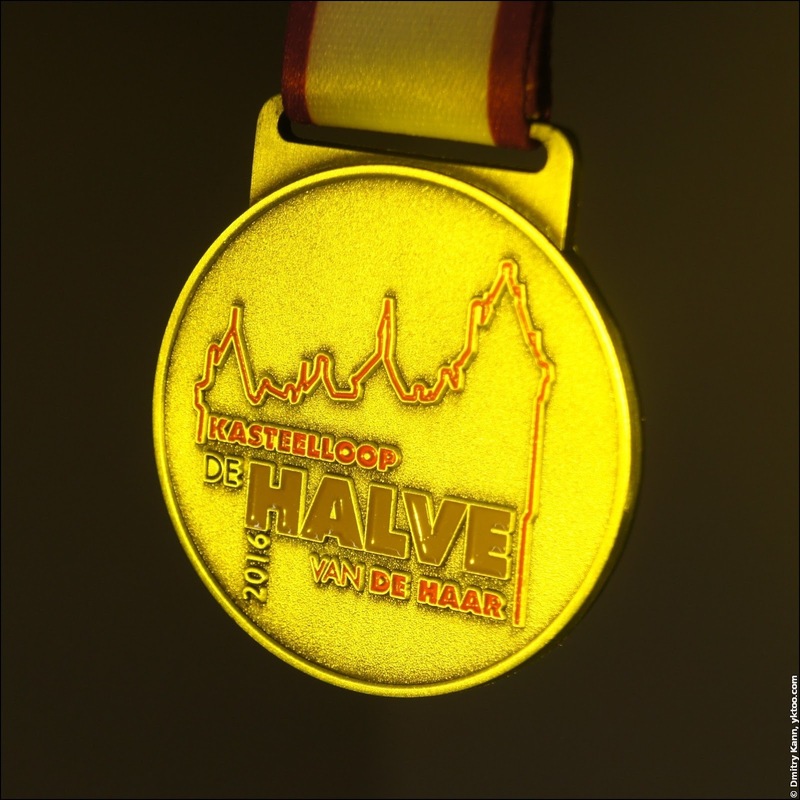 It's the second edition of De Halve van de Haar, and half marathon (21.1 km) was the longest distance available. The medal is actually grey, it's the light that tints it. Last time the distance was only a half of that (10.5 km), and I remember myself looking at the half-marathoners after having finished and being happy I wasn't among them. In fact, I could hardly imagine how one can run such a distance. But the time runs fast and so do we. 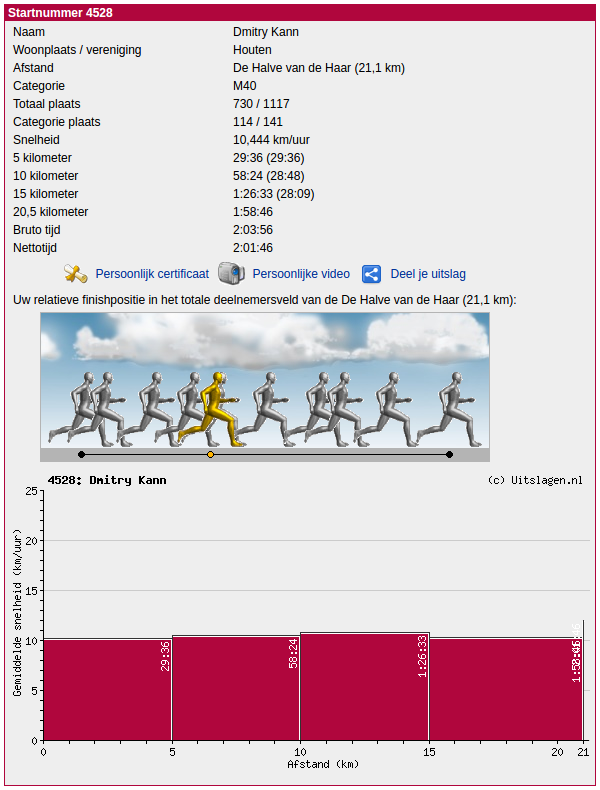 At the beginning of this year I decided to run fifteen kilometres instead of the usual ten, and that proved to be not as hard as it seemed. On the contrary, the further you run, the more you like it. Pretty addictive it is. But then new difficulties arose: I had to find new routes as the former ones did not fit the bill. 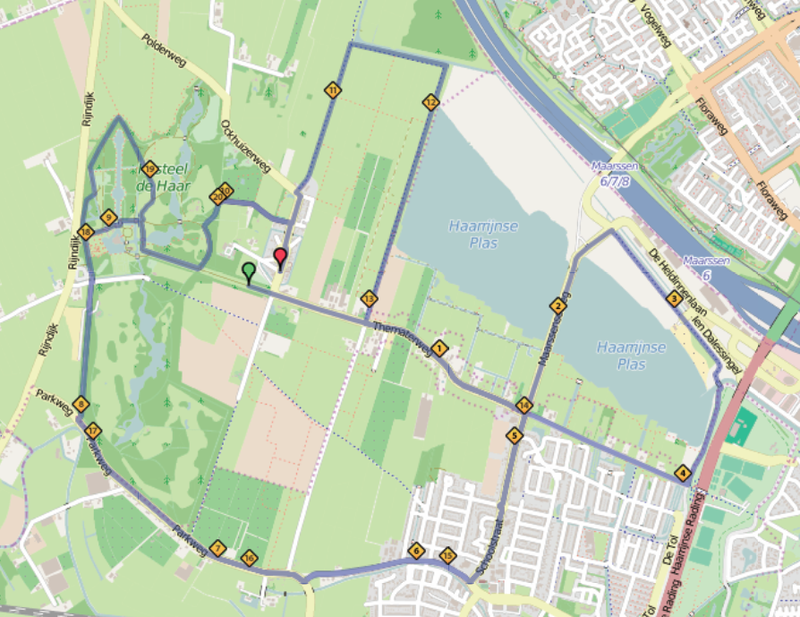 The 15 km track could still be run at my favourite alongside the Amsterdam-Rijnkanaal, but on a twenty-kilometre one I ended up in the centre of the nearby town of Nieuwegein, which I didn't find appealing. I strongly prefer uninhabited areas, free of people, cars and dogs. Long story short, I'm still looking for a perfect running route. Back to the half marathon, we've had there difficulties too. Firstly, traffic jams. 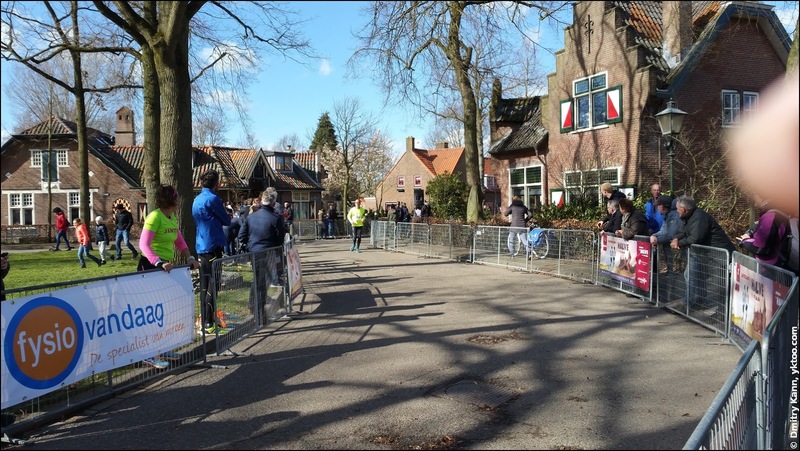 Even though various distances started at different times, the event seemed to be more popular this time, and the country roads around Haarzuilens could hardly accommodate the traffic. Furthermore, many of the town's streets were closed just because of the run. Luckily, we had plenty of time so it wasn't really an issue. Secondly, parking. The parking lot was a huge grass-field that could fit perhaps ten times as many cars. But it had rained in the morning so the soil's got quite damp here and there. As soon as we drove off the driveway paved with metal sheets, the front wheels got completely stuck, whereas the rear bumper was still protruding on the road. Pushing the car turned out quite futile so I asked the traffic guy for help. He told me to stop worrying and go for my run, as we'd take care of it afterwards. Stopping worrying isn't that easy when you know your rear bumper is blocking half of the driveway. Thirdly, wind. Or, rather, gale. The rain wasn't the only challenge imposed on us by the Dutch weather. Force 7 winds were battering the runners, which, multiplied by the distance, made one feel desperate at times. 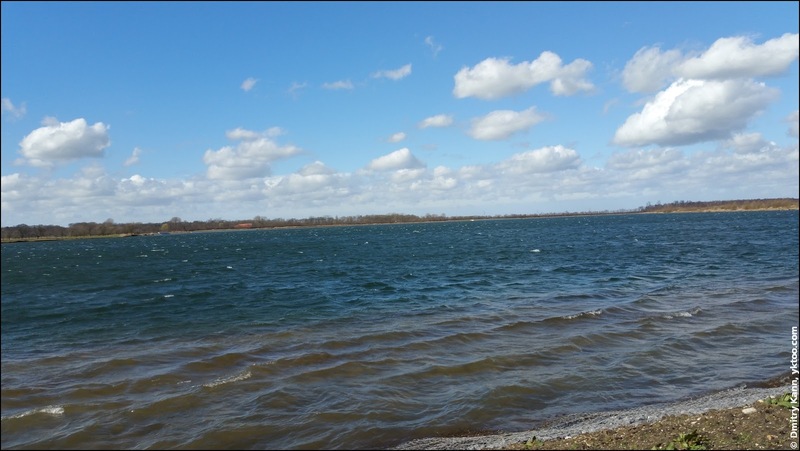 Somewhere halfway a head-wind was blowing incessantly for some 1.5 kilometres. On the bright side, it stayed dry during the whole run. Fourthly, after having completed the track I failed to find my result on the website, whereas my girlfriend name was there straight after she'd finished. I had to sort it with the timing company myself. There was a total of 1117 participants in the half marathon, which is quite a few for such a limited space. Stumbling along in the crowd I didn't even spot where exactly the start line lay. If you forget the wind, the day was very bright and fairly warm. According to the Wikipedia, winds of 7 Beaufort cause waves up to 5.5 metres high. Luckily, not in this little pond as they would have washed us all away. 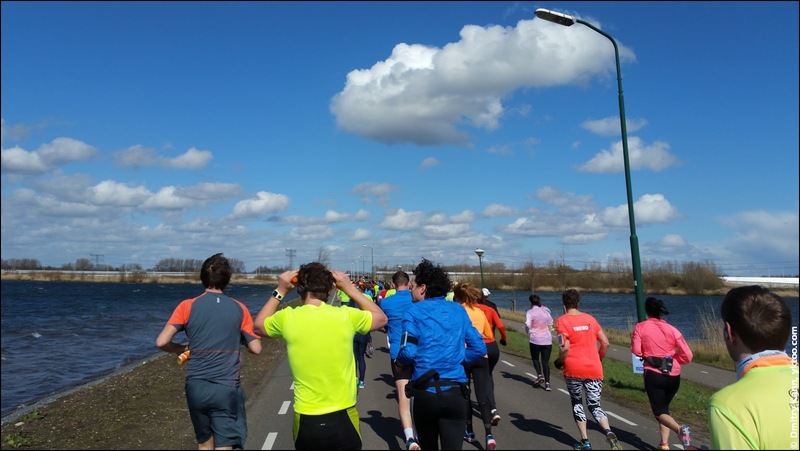 It becomes much easier to run once the runners spread along the road. As always, lots of spectators watched at the roadside and gave the runners pep-talk. Once a woman shouted "Kom op Dmitry, doorzetten!" ("Come on Dmitry, press ahead!"). I stared at her in a momentary astonishment, trying to remember who she was, until I realised I had my name printed on the number. At another spot I overheard a man, disappointed at the lack of response from the running lot, saying to his neighbour "Een beetje autistisch gedrag, maar goed" ("A bit autistic behaviour, but okay"). 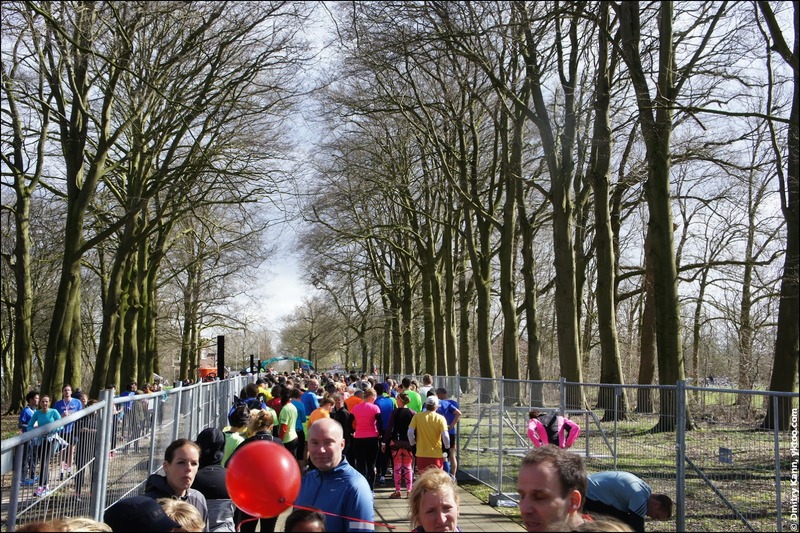 The route consisted of two almost identical laps of about 10 km, leading around the gardens of the De Haar castle. The track of the half marathon. After all, what doesn't kill us, makes us stronger. I've made it to the finish line. As it turned out later, my results were missing on the website because the time registration point at the finish line failed to read my number. A representative of the timing company inferred I pressed my hand against the number when pushing the stopwatch button, thus blocking the RFID signal. He calculated my total time based on the last measurement, which happened 600 metres before the finish, and it amounted to 2:01:46, however according to my stopwatch it should be 2:01:03 (which is fair enough as I've did my best covering the last stretch). But okay, the difference is not that big anyway. So I've earned the 730th place, which is not brilliant, but not too bad either, considering the gale. Certainly there's a lot of room for improvement. When we got back to the parking lot, our car was still intact and undamaged, what a relief! Moreover, a car nearby was even in a worse position as it got stuck blocking almost the entire driveway. A squad of 6-8 people walked around the lot, helping with getting the cars back on the road, sorting it for us in no time. Which I'm very grateful for.